Page 43 contains some fascinating dialogue that is evident of a certain facetiousness (trolling) by Herge. The part where Tintin says "A lot Europeans still believe that all Chinese people are eating [...] swallows' nests" has the appearance of attempting to discredit a trope, but actually the nests remain a delicacy in China to this day. 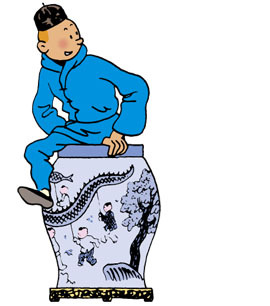 Tintin also says that Europeans think all Chinese females undergo foot-binding and that unwanted babies are dumped into rivers. Again, Herge is somewhat sarcastically countersignalling the trope, because some foot-binding had still been occurring not long prior, while gender-selective abortion was certainly also happening at that time. Five star for five ! I have this book in first edition both in B&W and Color. It is hard to say what is the best of the two, the B&W has some full color pages which are like master piece, while the first edition in color on this amazing thick yellow paper, gives to the story something really unique and fits perfectly to the atmosphere of the story! Perhaps my personal favorite of all Tintin books. My favourite album with all the colour and intrigue of the Orient! Love it!